for possible unification title fights with WIBA World Champions. in the Top 15, or receive the approval of the Ratings Committee. controversy or dispute first arose. after receiving referral of the controversy or claim, to render a decision. Trinidad & Tobago: Dr Keven Antoine, Erva Bruno. Virgin Islands: Adlah "Foncie" Donastore Jr.
Ukraine, United States, Uruguay, Venezuela, Virgin Islands, Zambia. 2. WIBA World Title fights are ten (10) rounds. are eight (8) or ten (10) rounds. WIBA Youth Titles can be 6 or 8 rounds. 3. a WIBA Supervisor must be present, at the weigh-in and the fight. the title fight may still procede at scheduled. 6. Gloves are 8 oz for bouts at 147 pounds and under. 10 oz gloves are used for fights at 148 pounds and heavier. 7. Coagulants may consist of adrenaline 1/1000, avitene, and thrombin. Any others are subject to approval by the local commission. Monsel, or any other "iron base"
or "iron type" solution is absolutely prohibited. unless certain sports drinks are apprived by the local commission. by the  local Commsion and the WIBA supervisor. The Association of Boxing Commissions (ABC). We comply with the Muhammad Ali Act. it is agreed to by both camps and by the local commission. 1.2 The number of rounds in all contests shall be specified. 1.3 All WIBA World Championship bouts shall be of ten (10) round duration. titles shall be of six or eight round duration. ALL WIBA Youth title bouts shall be of 6 or 8 rounds. available, given a legitimate offer from a promoter. being called for to declare a new champion. months, it is within the WIBA's sole discression to vacate a title. 1.6 WIBA encourages title unification. (WBC, WBA, WBO, IBF, WIBF, GBU, IFBA, WBF, IBO). on the line, the Approval of the WIBA must be obtained. title fight sanctioned by an organization other then the WIBA. or to not recognize a WIBA champion if the sanction fee is not paid. -does anything to damage the reputation of the WIBA. given a legitimate offer from a promoter. by the WIBA, both boxers' camps and the local commission. makes weight wins, then she is recognized as champion. If a WIBA champion fails to make weight, her title is vacated. provided by the Promoter of that event. (10) ounces for over the 147 lbs weight Class. dispute regarding two similar colors between boxers. 1.19 All Boxers must use a mouthpiece during the bouts. The fight cannot begin without both fighters having a mouthpiece. Having 2 mouthpieces is recommended. a mimimum of 20 feet X 20 feet platform. 2.0 Bouts are scored on a Ten (10) Point Must System. of the opponent above the belt. slipping, guarding, ducking an attack, and ring generalship. 2.3 No Standing Eight (8) Count rule shall be in effect in all bouts. issue a Mandatory Eight (8) Count to the fallen boxer. 2.4 Only the ref can stop the fight. they have twenty (20) seconds to "beat the count"
by getting back into the ring unassisted by their seconds. they shall be disqualified by the referee. (the "laces" referring to the palm side of a glove and forearm). can result in immediate point deductions, or disqualification. from each judge's card for that fighter for that round. (e) There shall be no striking with elbows or forearms. neck; no hitting to the kidney or the back of any fighter. For that fighter for that round; and may result in disqualification. when so ordered to do so. who has fallen to the floor or who is knocked down. retreat to a neutral corner. boxer causing the injury to be disqualified. from the boxer who caused the foul. POINTS DEDUCTIONS FOR INTENTIONAL FOULS ARE MANDATORY. and even disqualifications in certain situations, by the referee. (m) There shall be no other unsporting acts or conduct. which boxer is at fault in any of the cases listed above. Board standards whether the bout shall continue. according to the local commission rules for testing and examination. according to the State's rules for examination. either before or during a Bout, is strictly prohibited. This includes Smelling Salts, Ammonia Capsules, or similar irritants. Any of the contestants violating this rule are subject to disqualification. 3.3 The discretional use of vasoline is allowed around the eyes. or body of either contestant is prohibited. prior to the Commencement of the bout. whenever considered necessary, before or after a bout. 3.6 Uninalysis tests are mandatory for boxers after title fights. Should thtspecimen prove positive, disciplinary action will follow. before any bout For the protection of the boxer. No boxer who is pregnant will be permitted to fight. rankings to determine a new champion. must fight the active champion to regain her old standing. will be able to defend her tide. within section 3 of these rules. the Referee during the course of a boxing contest. Boxers and Promoters, Managers, Agents or others. out of said agreements or contracts. the highest purse money will get the fight. they promote under the auspices of the WIBA. or to the boxer's Representative at the boxer's request. unless agreed to by the Promoter. plus $680 for WIBA Belt. 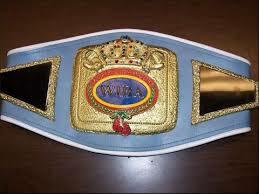 $1000,  plus $680 for WIBA Belt. Monies are due 21 days prior to the bout. The WIBA takes 0% of any fighters purse for sanctioning fees. for WIBA World Title fights, judges are to be paid $200 USD. and the referee is to be paid $250 USD. supervisors are to be paid $300 USD. for the newly crowned champion. Only the winner of the contest can obtain the belt. and travel arrangements for the representatives of the WIBA. of any monies owed to the WIBA by the promoter. 5.12 All WIBA sanction fees are non-refundable. within 6 months of the original event date.